Kombucha is a drink that you may have never come across with it before. But it’s not something new, its been around for more than 2,000 years. It is a beverage that comes from China, as the people there called it the “Immortal Health Elixir.” It has been used in the prevention of arthritis, cancer, and many other degenerative diseases. It is gaining more and more popularity among celebrities, as we all know that they would do anything to stay young and healthy. Celebrities, who are known to drink kombucha every day are Madonna, Halle Berry, Reese Witherspoon and Gwyneth Paltrow. I still remember my first time when tried Kombucha (ages ago), I was disgusted by its taste. It was something between sweet and sour vinegar and did not like it at all. It started growing on me when I decided to make it at home. Today, if you ask me to describe its taste, I would say that it tastes like cider. Kombucha is a refreshing fermented beverage, obtained by the fermentation of tea with a distinct yeast culture called “SCOBY”. This live culture looks like a mushroom, but it is not an actual mushroom. It has an ability to reproduce, so each time you make Kombucha, you will have a new ‘Scoby’ to give away. Aids Digestion. Kombucha is full of antioxidants that counteract free radicals and create mayhem in our digestive system. But the greatest reason kombucha supports our digestion is because it has high levels of probiotics (Gluconacetobacter, Acetobacter, Lactobacillus, and Zygosaccharomyces) beneficial acids and enzymes. Some studies have shown that kombucha has an ability to prevent and heal stomach ulcers. That is because it helps in protecting the mucin content in the gastric tissues and decreasing the secretion of excess gastric acids. Immune Health. As I already mentioned above kombucha has an ability to control the free radicals in our body, as the most powerful antioxidant is known as D-saccharic acid, 4- lactone (DSL) and it is discovered during the fermentation process of kombucha. Moreover, it is clinically proved that this drink relates immunosuppression and can reduce oxidative stress. Many scientists believe that this DSL and the presence of Vitamin C in kombucha are the main secrets in preventing immune system suspension, cell damage, and tumors. Diabetes. Kombucha is also known for its effectiveness in curing diabetes. The two main reasons for that are that Kombucha is a natural therapeutic agent which helps in suppressing the factors implicated in diabetic conditions and aids in the superior deterrence of the elevated blood glucose levels. Furthermore, kombucha tea has an ability to heal the pancreas, helps in guarding the liver and kidney functions by reducing the concentration of urea of the diabetic individuals. Joint Care. Kombucha has an ability to repair, prevent and heal joint damages because it is loaded with glucosamines that increase the production of hyaluronic acid. This acid helps in the maintenance of cartilage structure and provides relief from the pain associated with arthritis. Lowering the bad Cholesterol. The results of many studies have shown that Kombucha has antilipidemic properties that help in reducing the absorption of the bad cholesterol (LDL) and triglycerides and increase the levels of the good cholesterol (HDL) in out body. Cancer Prevention. Last but not at least, kombucha has an ability to prevent or recover our body from cancer. Research conducted by Luman, 2015 has shown that glucaric acid reduces the risks of cancer in humans. This acid can be found in Kombucha. 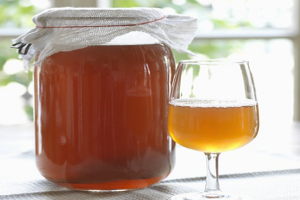 How to make Kombucha at home? 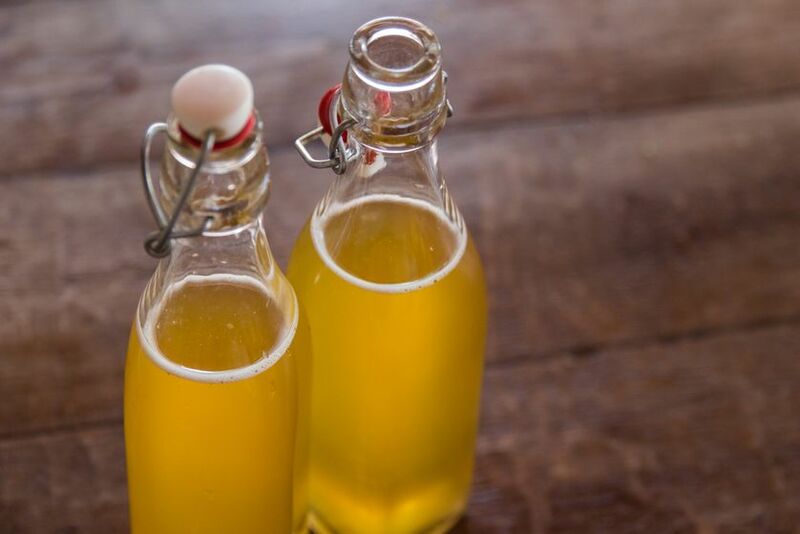 To make Kombucha at home is very easy. This is what you need. t should be no more than blood heat before you add it to your culture, so if it’s still too warm then let it cool down before you add it to the bowl. before you add it to the kombucha culture! Hot tea can kill the culture. It should be no more than blood heat before you add it to your starter. Add the kombucha SCOBY. Pick up your SCOBY and slide it into the bowl. It will probably float but sometimes they sink. It will make no difference if it floats or sinks so don’t worry about it. If the scoby has a ‘dirty’ side where it’s darker in colour and has beard like brown bits sticking to it then put that side facing down into the tea. The brown bits are yeasts. Put your tea towel over the bowl and secure it with a rubber band or a piece of elastic. This keeps contamination out of your culture. Fruit flies especially like the smell of kombucha and can appear like magic out of thin air to lay their eggs in the scoby. So it’s important to cover it properly. Put the bowl in a warm dark place (23°-30°C or 70°-86°F) like an airing cupboard or a kitchen cupboard or near a radiator. The fermentation will take 5-14 days depending on the temperature. If you check your brew after 2 or 3 days, you’ll notice a scum forming on the surface. It’s not scum at all; it’s the first thin membrane of your new kombucha SCOBY. Start tasting the brew after 4 or 5 days. Gently move the Scoby aside and dip a spoon into the liquid. When the kombucha is ready, it should be neither too sweet nor too sour. This is rather a personal taste and will depend on how much sugar you want to be left in the brew. Some like it sweet but others prefer it sour. It’s up to you, so test it every day until its the way you like it. When the kombucha is ready, with clean hands gently lift the mother culture and it’s offspring out onto a clean plate. Strain the kombucha into your measuring jug leaving behind about 200ml in the bowl as a starter for the next batch. 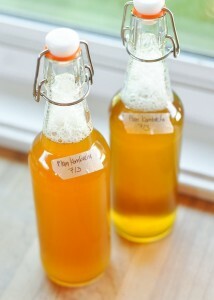 Now fill your clean bottles with the kombucha, label them and store them in a cupboard or the fridge. You can use any kinds of bottles but some batches will be a lot fizzier than others and it’s a good idea to use pop bottles, like the Grolsch bottles, that have rubber gaskets on them. This kind of bottle will let out any excess pressure and prevent explosions! After bottling your kombucha make up the second batch of tea for the culture and set your second brew to ferment. Kombucha is ready to drink immediately, but storing the bottled kombucha for a month or two will give you will give you an even better drink. This kind of bottle conditioning can improve the flavour as any home wine brewer will know. The sugar continues to ferment a little, giving you lighter, drier taste and producing more fizz. The kombucha will often grow little scoby’s on the top of the liquid in the bottles. This is perfectly normal and nothing to worry about but look out for them when you take your first mouthful! I use this recipe to make my Kombucha, I took it from this website www.seedsofhealth.co.uk. If you want to make a ginger or fruit kombucha (you can use any fruit) just wait until your kombucha is ready and add inside chosen fruit and wait at least 7 more days. Cheers !! !